The city of San Francisco spent $310,000 on a new registration system to enable noncitizens to vote in local school board elections, but as of Oct. 28, the effort had produced only 49 new registered voters for the Nov. 6 election. That means the city spent more than $6,326 for every noncitizen it registered, the San Francisco Chronicle reported. John Arntz, the city elections chief, told Fox News that noncitizens have the option of voting in school board elections and will be registered on a separate roster, apart from voters who are citizens. Arntz says they will receive a ballot only for the school board election and cannot vote in other contests. The city began registering noncitizens—including illegal immigrants—to vote in school board elections in July of this year, after passage of a 2016 San Francisco ballot measure allowing noncitizens to vote if they are over the age of 18, city residents, and the parent or guardian of a child under 19 years of age. San Francisco, a “sanctuary city,” was the first jurisdiction in California to do so, and the largest city to pass such a measure in the entire nation, according to Fox News. Robin Hvidston, the executive director of We the People Rising, a Claremont organization that lobbies for stricter immigration enforcement, told the Los Angeles Times that the move would only further fire up conservatives in California already concerned about a large caravan of migrants trekking toward the U.S. border from Central America. The San Francisco Unified School District does not have exact numbers on how many noncitizen students are in its system, the Los Angeles Times reported. The district has 54,063 English-language learners, or 29 percent of its student population, according to the school district’s website as reported by the newspaper. Fox News reported that the majority of the city’s English-language learners list Spanish or Chinese as their first language. 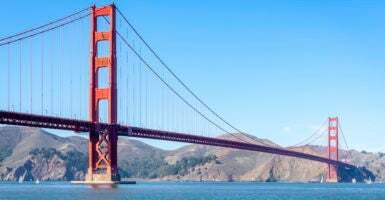 An estimated 35,000 illegal aliens reside in San Francisco, according to a 2017 Pew Research report. The $310,000 spent on the new system included efforts to encourage noncitizens to sign up, according to the Chronicle report. Some city officials blamed the low number of people registered on President Donald Trump’s tougher stance on immigration and fears that Immigration and Customs Enforcement could subpoena voter rolls to find and detain illegal immigrants. City Supervisor Sandra Lee Fewer called on the city to spend up to $500,000 to warn illegal aliens of the risks of signing up to vote. Then-Mayor Mark Farrell opposed her initial request for $125,000, the Chronicle reported. But in May, the city’s board of supervisors passed an ordinance requiring a notice of the possible risks of registering be included with all registration affidavits and election materials, the Times reported. “American citizenship is a special privilege we extend to legal immigrants who comply with our laws and become naturalized,” said Hans von Spakovsky, manager of the Election Law Reform Initiative and a senior legal fellow at The Heritage Foundation. According to the Times, California already provides illegal aliens with driver’s licenses, college tuition breaks, and child health care.